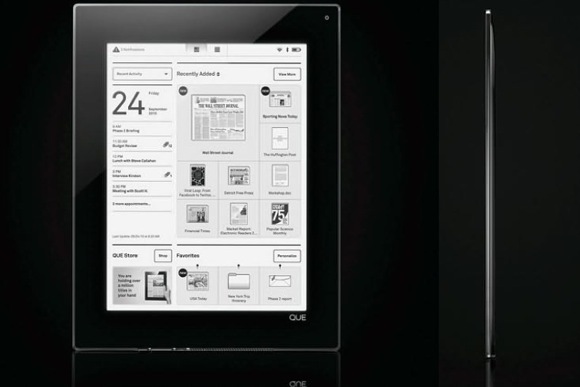 Just as Apple puts up some impressive pre-order numbers for its iPad, Plastic Logic comes forth with some unfortunate news about its own Que: the slick-looking ebook reader is being delayed until summer. The Que is an interesting reader, with its focus on business–in the grayscale world (heyo!) of ebook readers, features like Microsoft Outlook support, full integration with BlackBerry, and the ability to edit Word and PDF documents are impressive and unusual. But in the wake of the iPad announcement, everything looks different: suddenly, that easy-on-the-eyes e-ink screen seems like more of a liability, with its inability to handle color, video, or quick refreshing, and its high price. The highest-end model of the Que is an 8GB model with 3G, checking in at $800; in contrast, Apple’s cheapest 3G model offers 16GB of storage, a proven app store, relationships with next-gen book publishers like Penguin, tons of press, and a $630 price point. So the last thing the Que needs is more delay, but delayed it has been. Richard Archuleta, CEO of Plastic Logic, says the company needs a little more time to “fine-tune the features and enhance the overall product experience,” which could mean just about anything. Regardless, we want to like the Que–but time is not on their side.